It's back to the 1960s. In 1962 with the Cuban Missile Crisis, children learned that they might be snuffed out at any time. The assassination in November 22, 1963, of President John F Kennedy, who prevented the threatened atomic war with Russia over Cuba, seemed to make this clearer. Someone we knew who was 11 when Kennedy was assassinated, suicided in their late 20s because they had never recovered from despair at the prospect of the nuclear holocaust destroying all the forests and creatures in the world, along with the species that had unleashed this insanity. President Trump presented no reflection about North Korea's motivation to acquire these nuclear weapons. In that sense, if you knew the story, it was like hearing a drunk threaten to punch his wife if she tried to protect herself. Trump is sitting on top of a mountain of nuclear warheads and the US has armadas of warships constantly patrolling Korean waters in a threatening fashion. 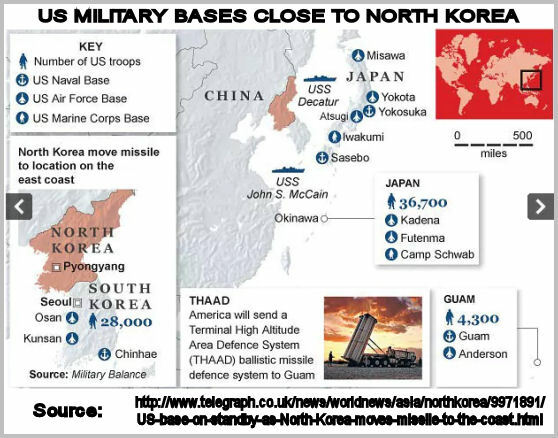 That is what Kim Jong-un is responding to; the current US military presence and the past record of occupation and war by the same presence. North Korea does not have ships patrolling US waters. Basically, the United States invades any country it wants to, unless that country has nuclear weapons. It has done this on similar pretexts already to Afghanistan, Iraq, Libya, Syria and constantly threatens Iran. It would do it to Russia if Russia had no nuclear weapons. Indeed it has Russia quasi surrounded by US military bases, many situated in Europe in countries where the local populations may not want them. The United States has "800 military bases in more than 70 countries and territories abroad," yet it pretends that Russia, which has ten foreign military bases, close to its own borders, is the one bent on military expansion. China has one military base in Djibouti and several in process in the Pacific on artificially augmented islands. When President John Kennedy stopped nuclear war on Russia via Cuba, President Kruschev and he talked on the phone and began a nuclear weapons disarmament program in 1963. See https://www.jfklibrary.org/JFK/JFK-in-History/Nuclear-Test-Ban-Treaty.aspx. In 1996, 71 nations, including those possessing nuclear weapons, signed the Comprehensive Nuclear Test Ban Treaty, which prohibited all nuclear test explosions including those conducted underground. Though it was signed by President Bill Clinton, the Senate rejected the treaty by a vote of 51 to 48. With the dissolution of the Soviet Union in 1991 much of the impetus for a nuclear program seemed to disappear. Perhaps the United States really thought that Russia was going to become a subservient client state, like Australia, but Russia has its own history and traditions. It has not gone back to communism, but it does not seek the same kind of free-market regime as America and does not want NATO on its borders. The United States does not appear to accept this political and economic independence in Russia or China or, indeed, in any state. Hence their ramping up of nuclear threat when people hoped it was reducing. Now, today's young people must live in that terrible shadow of nuclear holocaust again, and some will lose hope. North Korea has been under siege for about 72 years since the Japanese colony of the Korean Peninsula was divided in two between Soviet and American occupation forces after Japan surrendered in 1945. In August 1948 the Republic of Korea was established in the south with Syngman Rhee as President. In September 1948 the Democratic People's Republic of Korea was established with Kim Il-sung as Premier. In 1949 Kim Gu, a Korean independence activist who wanted a unified Korea was shot in his home by a South Korean Army lieutenant. The United States say that North Korea invaded South Korea and so the United States went to war against North Korea. North Korea says the war started when the South launched an attack against the North and so the North counter-attacked. But that in itself is not the critical issue. The critical issue is that sovereignty in the south was violated by the US occupation and thousands, maybe tens of thousands of supporters of the 'North' Korean government were murdered and jailed by the South Korean government with the help of the Americans. Something like 20% of North Koreans died in the subsequent war. They were victims of America's massively disproportionate firepower. America only agreed to a truce because China and North Korea were able to resist with their own firepower until US loss of lives (much fewer than those of North Korean soldiers) became unpopular in America. Australians also participated in this war and at one stage Australian warfies blackbanned supplies to the Australian armed forces. Understandably North Korea sees the continuing presence of US military armadas for the threat that they are, along with annual US military 'exercises' on South Korean soil. As John Pilger explains in his Coming war on China the US threats against North Korea may also be interpreted as threats against China. The United States is demanding that China take military action against North Korea if North Korea fails to disarm its nuclear program. But North Korea is useful for China by providing a bullwark against US aggression. And Russia and China share a defensive attitude to US expansionism. Meanwhile just about every US ally (or are we US hostages?) mass media and much of the supposed alternative newsmedia, including Infowars, Hannity and Tucker Carlson, is reporting all this as Trump portrays it, vis, that North Korea is insane and threatening America with no reason at all. No, Kim Jong-un does have a reason. If America does not lead nuclear disarmament and stop its expansionism, which is what Trump led people to believe he would do, then who can lead it? 'Natural News' calls for the US to "deal with North Korea NOW"?! Over the last several years, I've repeatedly warned that North Korea posed a grave threat to the civilized world. It's now clear that North Korea must be dealt with in an aggressive way, even if it means causing collateral damage. South Korea, Japan, Taiwan and the United States are all now potential targets of Kim Jong-Un's nuclear strikes. Given that Kim has openly stated his intention to launch nuclear strikes on key U.S. cities, there's no justification for any delay in acting out of national self-defense to stop this threat. I think it appalling that Natural News is now actually calling for military aggression by the United States against North Korea. The Government of 'North' Korea was founded by Koreans who had resisted the Japanese invaders prior to and during the Second World War, whilst the government of 'South' Korea was composed of Koreans who had collaborated with the Japanese invaders. 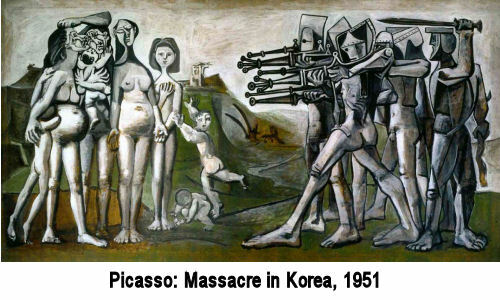 Between 1945 and 1950, the American occupiers and their South Korean accomplices brutally repressed Koreans opposed to their rule. killing tens of thousands. North Korea lost 20% of its population as a result of America's invasion between 1950 and 1953. As Doctor Strangelove (aka General Curtis Le May) once boasted, not one building more than one storey high was left standing at the end of that war as a result of the ferocious aerial bombardment of North Korea by American B52 bombers. Every year, North Korea faces the prospect of a repeat of that experience, or worse, when the American occupiers and their South Korean accomplices conduct their annual practise invasion (sorry, 'military exercise'). Why shouldn't a country which has been through all the experiences that North Korea has, possess whatever is necessary to deter America from yet more military aggression? Mike Adam's claim that Iran has nuclear weapons disregards the fact that Iran's civilian nuclear power plant has been inspected on numerous occasions and no evidence of the production of nuclear weapons has been found. He also disregards the fact that Israel supposedly threatened by Iran;s supposed nuclear weapons has a large illegal cache o nuclear weapons. I would be most interested to so how Ron Paul, whom Mike Adams claims to sympathise with, responds to the above article and video.